"The Story of Eràsis Niksubvya"
In 1918 Standard Count, the lead singer of Tapestry, Eràsis, jumped to her death at the Great Falls. One day later, the most devastating and thorough computer virus in history erased almost all data connected to her. Only her music and several fragmentary interviews remain. Amkzí, a canyon woman living at the close of the twenty-first century, embellished the remaining information in her letters to a man named Nishet. Her narrative, along with the identity she claimed, captivated him. Some say her writings even drove him mad. Regardless, Amkzí’s story builds the well-known biographical facts into the nightmare of family intrigue and political assassination that haunted Eràsis to her grave. The serial novel updates on Tuesday evenings. Ossia has not been tagged yet. Help others find Ossia by tagging it! 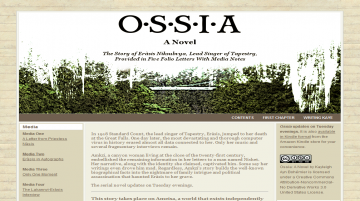 Ossia has not been reviewed yet. Ossia has not been recommended yet.